Based on the book Touching The Rock by theologian John Hull, Notes on Blindness is a refreshingly imaginative twist on the documentary genre. Actors Dan Skinner and Simone Kirby play the roles of John and his wife, Marilyn, and lip sync to the audio tape recordings of the real-life John and Marilyn Hull. John had gradually lost his sight until it disappeared completely in 1983. He explains articulately and candidly what it actually feels like to lose his sight and what he has learned from that experience. Much of the doc is somber and melancholic, but so what? That doesn't make it any less interesting; in fact, it makes it more interesting because nothing is really sugar-coated. It's quite lyrical and provocative way when Hull admits that the memory of what his wife looks like has been getting blurrier and blurrier until he forgot what she looks like. Co-directors James Spinney and Peter Middleton enrich Hull's words with poetic, beautifully-shot imagery. 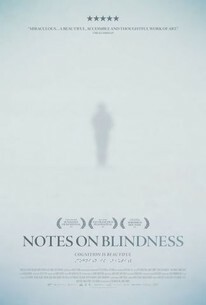 If the running time of Notes on Blindness were closer to 2 hours instead of 90 minutes, you would've felt the weight of the running time and it would've been exhausting, so kudos to the directors and editor for finding just the right balance between entertaining the audience, and provoking them emotionally as well as intellectually. It's a genuinely moving, profound and haunting experience that might change the way you perceive the sights and sounds around you. Bond/360 opens Notes on Blindness Wednesday, Nov. 16th at Film Forum. Off the Rails is quite a compelling documentary because it has a fascinating story and a very complex subject, Darius McCollum. He has Asperger's Syndrome, and has been obsessed with the NYC subway trains and buses since a very young age. He knows the subway and bus system better like the back of his hand, and learned how to drive trains with the help of MTA conductors whom he had befriended. Disguising himself as an MTA employee with the appropriate uniforms, he drove buses and trains all on his own, and safely transported passengers to their destinations. When he was finally caught, he ended up in prison. Upon his release, he went right back to driving the buses and trains illegally. There's much more to McCollum than meets the eye. Fortunately, director Adam Irving allows you to get to know McCollum to empathize with him. He's not a bad person; just someone who clearly needs a lot of psychotherapy. It's equally heartbreaking and infuriating to learn that he never received the proper mental health treatment to deal with his mental issues and that the MTA repeatedly refused to hire him because they considered him to be too risky. 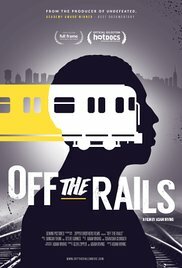 Although Off the Rails does delve into the roots of McCollum's mental health problems along with how and why he ended up illegally driving buses, and how the prison system failed him, Irving doesn't explore the elephant in the room that's part of a much larger, systemic problem: how racism in our justice system could have played a factor in how McCollum, who's black, was failed by the system. He was in and out of jail a total of 32 times---that statistic alone speaks volume. This doc would make a great double feature with Ava DuVernay's doc 13th and with Asperger's Are Us which also has a subject with Asperger's Syndrome who's also obsessed with trains. The Film Collaborative opens Off the Rails at The Metrograph. Number of times I checked my watch: 1 Released by STX Entertainment. Opens nationwide. Newt Scamander (Eddie Redmayne), a wizard, arrives on Ellis Island with a suitcase that contains a portal to world with magical creatures. When those creatures accidentally escape from the portal and into New York City, it's up to Newt along with Jacob Kowalski (Dan Fogler), a "No-Maj", to find them while the threat of evil forces are imminent. 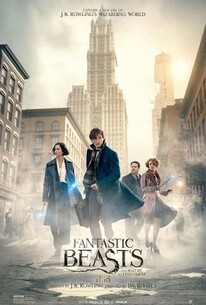 Meanwhile, he gets into trouble with Percival Graves (Colin Farrell), the Director of Magical Security, oversees Newt's hunt for the "fantastic beasts"
Although, the screenplay by J.K. Rowling, based on her book, has some kernels of interesting stories and characters, the film is so overstuffed with exposition and subplots that it never quite comes together in the magical, thrilling or exhilarating ways that any of the films in the Harry Potter series came together. 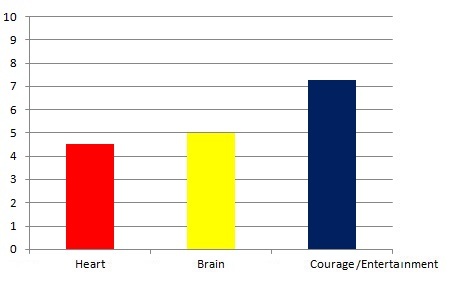 In order for characters, like Harry Potter, to be worth caring about, they have to be introduced in a way that allows the audience a passageway into their heart, mind and soul. Unfortunately, Rowling doesn't quite introduce Newt, nor anyone audiences are supposed to root for, in a way that captures those essential character elements. 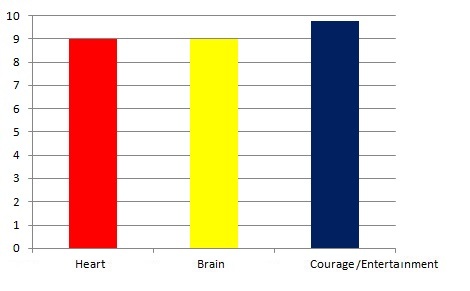 To be fair to J.K. Rowling, though, it's much easier to get inside a character's head via a book than via a film. Fantastic Beasts seems more concerned about its plot and showing off its nifty visual effects (a.k.a standard effects---it's been a long time since CGI could accurately be called "special"). As the great director/film critic Francois Truffaut once keenly observed, what makes a film truly great is when it has the right balance between truth and spectacle. Fantastic Beasts suffers from the ailment that most blockbusters suffer from: too much spectacle and not enough truth. Not surprisingly, the third act is where much of the "standard effects" take place, but it's merely eye-filling rather than soul-filling because it's hard to be emotionally invested in whatever the outcome will be. Moreover, the film has at least 3 or 4 false endings before the end credits finally roll each of which feels quite annoying. What makes Fantastic Beasts mildly engaging and adds a modicum of depth is its talented, charisma-filled cast. Eddie Redmayne is always captivating to watch no matter what film he's in---yes, even in Jupiter Ascending. The underrated Katherine Waterston also gives a wonderful, nuanced performance as Porpentina Goldstein (Katherine Waterston) who investigates Newt. Jon Voight, Ezra Miller and Johnny Depp briefly show up, but they have very little to chew on here. Pickett the Bowtruckle, the cute little green creature that befriends Newt, adds some much-needed comic relief as does Dan Fogler in his role as Jacob. If only the wonderful actors had a much better screenplay to work with. Number of times I checked my watch: 2 Released by Warner Bros. Pictures. Opens nationwide. Questions? Comments? Please click here.